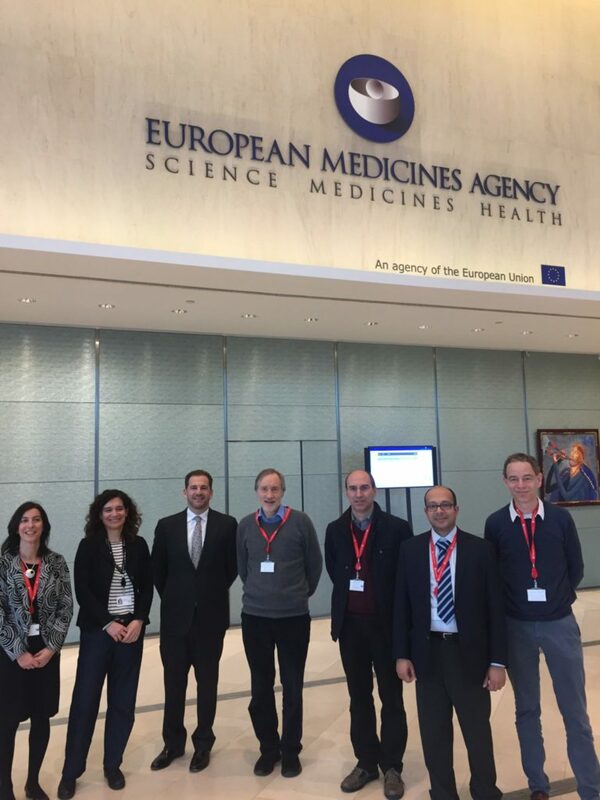 RESCEU Work Package 2 representatives met with the EMA Vaccine Working Party (VWP) on June 7th at the EMA in London, as part of the RESCEU efforts for establishing continuous communication and collaboration with Regulatory Bodies. The meeting began with a presentation of RESCEU, including an overview of the project and a detailed explanation of the outputs of Work Package 2. This was followed by discussions on how the Work Package 2 estimates of RSV disease burden in Europe will be of benefit to the EMA. RESCEU representatives and EMA VWP members agreed that Work Package 2 outputs will be of importance to the EMA as they will: highlight target groups for interventions, inform research investment prioritisation, inform the design of clinical trials (such as by aiding in the selection of appropriate outcomes and case/severity definitions), and produce “baseline” burden data that will help assess the impact of future interventions. RESCEU Work Package 2 will continue to engage with the EMA VWP, including sharing the results of the RSV burden estimates. 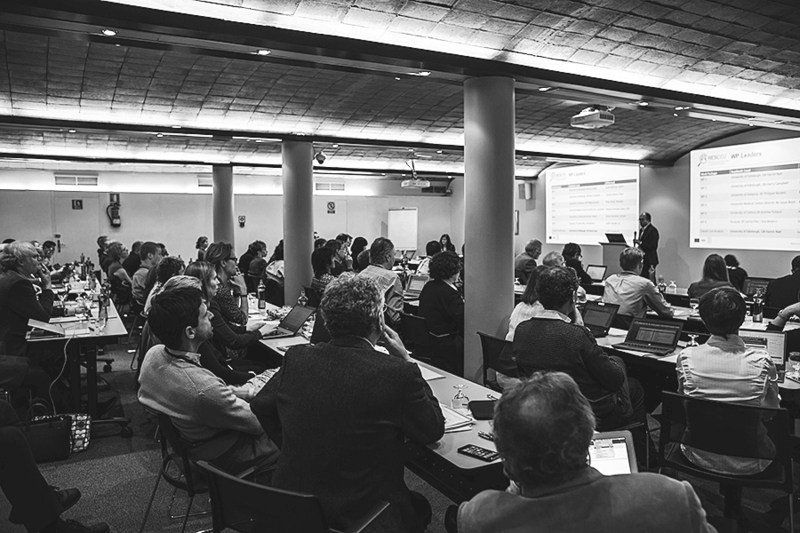 An EMA ITF Briefing Meeting with RESCEU representatives took place on March 16th at the EMA headquarters, as part of the RESCEU efforts for establishing continuous communication and collaboration with Regulatory Bodies. The purpose of this collaboration is to allow RESCEU to receive fundamental regulatory input but also provide, thanks to its experts and the data generated within the project, a useful and valid scientific support to EMA for all those matters related to the development of medicinal products intended for the treatment and prophylaxis of RSV infection. The meeting started with the presentation of RESCEU, its structure and objectives for the next 4 years, and was followed by a discussion where RESCEU Leads sought advice on ways for communicating with EMA and clinically related topics, such as information that should be captured by the clinical studies in view of future regulatory discussion. RESCEU’s clinical studies have started, with the aim of gathering data and addressing knowledge gaps on the impact of RSV infections. The investigation is building on the knowledge of a varied team of partners from universities and public health institutions, and includes 3 cohort studies on vulnerable populations (infants, older adults, COPD subjects) and one case-control study on infants after RSV infection. The first symptomatic participants were tested and visited for Respiratory Syncytial Virus in the 3 mentioned clinical cohort studies. As the RSV season had not yet started, all tested patients were still RSV negative: we can expect that first RSV diagnosis and therefore more exhaustive results will be available only with the beginning of RSV season. We are glad to announce the RESCEU membership in the International Severe Acute Respiratory and Emerging Infection Consortium (ISARIC). It is a global initiative aiming to ensure that clinical researchers have the open access protocols and data-sharing processes needed to facilitate a rapid response to emerging diseases that may turn into epidemics or pandemics. Please follow this link to learn more about ISARIC. 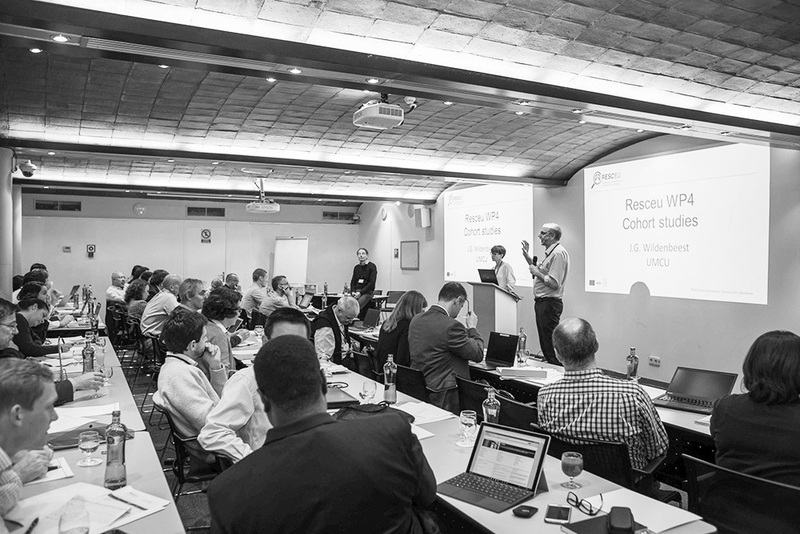 After many months of intensive preparatory work following a competitive call process, the Respiratory Syncytial Virus Consortium in Europe (RESCEU) was launched in January 2017. The RESCEU project aims to develop robust evidence on RSV disease burden and economic impact; create a sustainable Europe-wide multidisciplinary, multi-stakeholder community from academia, public health, scientific societies, patient organisations, regulatory agencies and industry; and provide infrastructure to perform future pivotal trials for RSV vaccines and therapeutics. RESCEU represents a major research effort of 29 million euro, and receives funding from the Innovative Medicines Initiative 2 Joint Undertaking, supported by the European Commission and EFPIA. 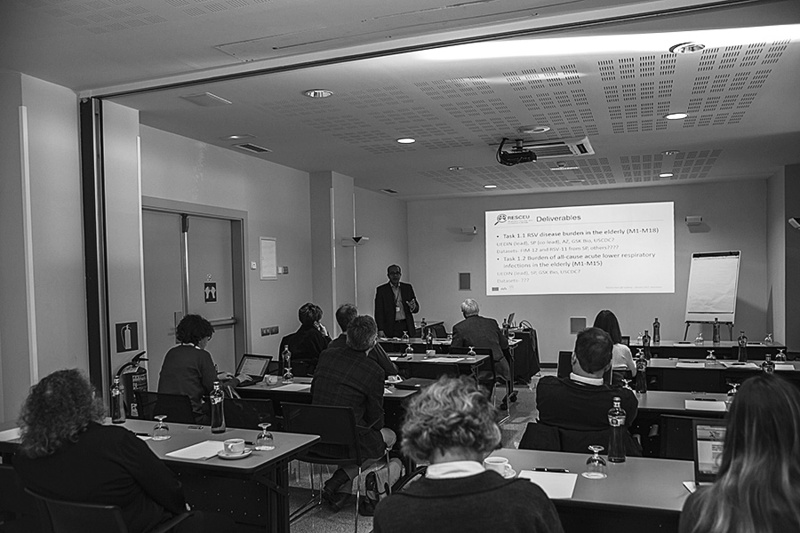 The launch meeting was held in Sitges (Spain) and it was a memorable occasion to have about 100 participants from key stakeholder constituencies (RSV researchers ranging from epidemiologists and clinicians to more basic scientists; Public Health Agencies like ECDC, US CDC and WHO; esteemed members of our International Scientific Advisory Group, Patient Advisory Board and the Ethics Advisory Committee; agencies like EMA and PATH; funding agencies like BMGF; and our IMI project officer) all participate wholeheartedly during the two-day meeting. The discussions were of very high quality and the enthusiasm was infectious. The Consortium is fully committed to sustain this positivity and make sure that we can achieve the objectives of RESCEU. Experts have received €29 million (£24m) to investigate serious lung infections that particularly affect babies and older people. 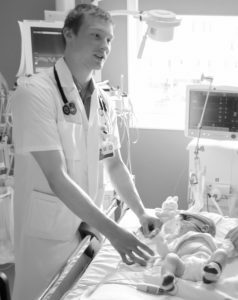 Diseases caused by respiratory syncytial virus (RSV) are estimated to affect more than 30 million children under five each year throughout the world. The virus also affects older people and those with weakened immune systems, including cancer patients and people with chronic lung diseases such as emphysema. 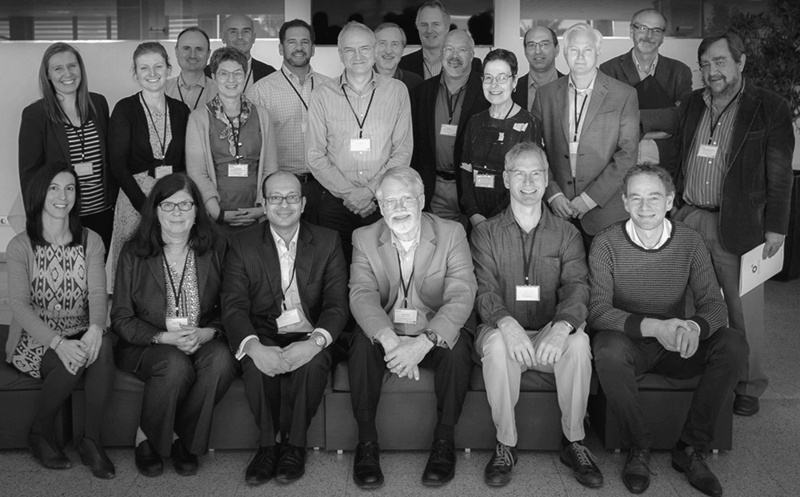 Led by Professor Harish Nair at the University of Edinburgh, the RSV Consortium in Europe (RESCEU) – aims to make a fundamental difference to the understanding and management of RSV. International teams will work to assess the full scale of the problem in Europe, which is currently unknown. Researchers will also assess the economic impact of the disease and the burden it places on healthcare systems. 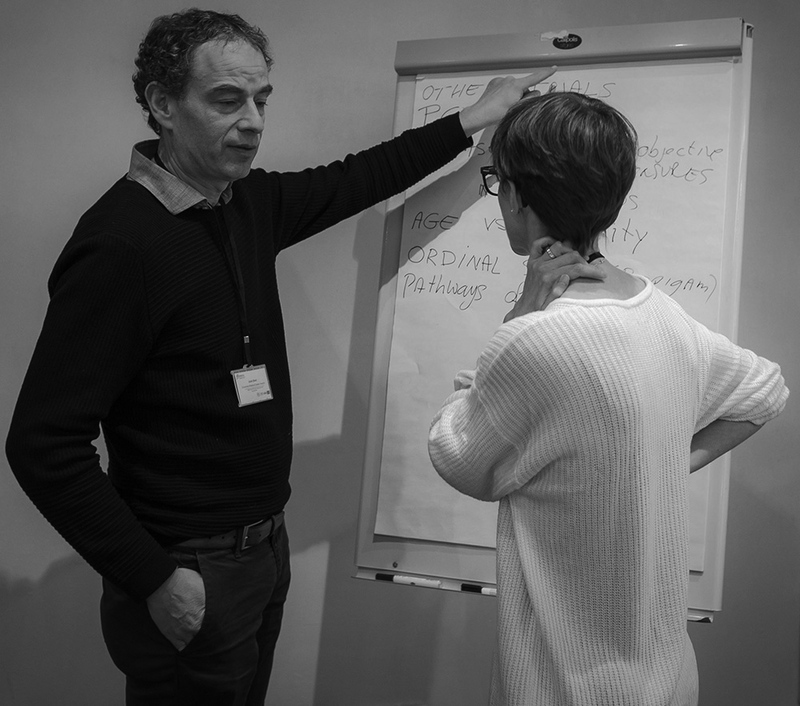 Armed with this information, the group will put together best practice guidelines to improve the way RSV-associated disease is monitored across Europe and to advise future vaccination programmes. The group also aims to set up a framework to conduct Europe-wide trials of new medicines and vaccines to improve treatment – and even prevention – of the disease. They will collect and analyse patient samples to identify biological markers associated with severe RSV infections. Such markers could help to improve diagnosis and assessment of the severity of disease. They could also aid the development of treatments and vaccines. Funding has been received from the Innovative Medicines Initiative 2 Joint Undertaking under grant agreement No 116019. This Joint Undertaking receives support from the European Union’s Horizon 2020 research and innovation programme and EFPIA. The collaboration includes the Universities of Edinburgh, Oxford and Imperial College London from the UK. Also taking part are teams from the University Medical Center Utrecht, University Medical Center Groningen and the National Institute for Public Health and The Environment in the Netherlands, the University of Antwerp in Belgium, the Galician Health Service SERGAS in Spain, the Hospital District of Southwest Finland, Statens Serum Institut in Denmark and the Paediatric European Network for Treatment of AIDS Foundation.